Sorting: Mondays first in Table View? I have converted my date fields to display as week days by using format "EEEE", and now I would like to show them on a Table view sorted by week day. But even if they are in the correct order, I can't manage to set my first row as Monday. Could you please help me how to set my first row as Monday and all the rest days sorted on the right order? Options (new field)>Value order, colour, shapes > and drag the little hands next to each text value to move it up or down and create the Category sort order you want. Thank you Paola, that was very clear and helpful. 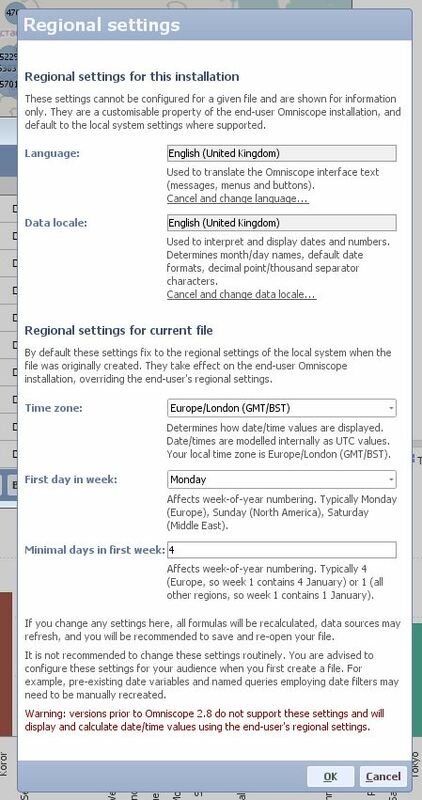 By the way, according to the "Regional Settings" I have changed the minimal days in first week from 4 to 1, is that ok or do you thing i will face date issue? and why is it 4 by default? Depends on where you're based... (please see the explanation in the dialogue box). This will affect your formulas where week number is used, e.g. sales in week 1, week 2 etc. Problem with the first week/last week in any year is that they tend to contain less than 7 days, so you have to decide how to 'break' the week that is split by year end. Ok I see, thank you!